Do you know what Mahabhulekh 7/12 is all about? Not many people are aware of it but the fact is that this Mahabhulekh 7/12 can prove to be very useful if you are planning to purchase a property in any city, village or town. Since you are not aware of the Mahabhulekh (Maharashtra Bhumi Abhilekh), we are going to talk about the details of Mahabhulekh 7/12 utara, 8A and property card (malmatta patrak) in this article and at the same time, we are also going to talk about the information listed on mahabhulekh.maharashtra.gov.in website. Apart from that, we will also discuss the process to get information from Maharashtra Mahabhulekh Online. To begin with, we will talk about the information listed on Mahabhulekh 7/12. In the section below you will find the Information that can be availed from Mahabhulekh 7/12. What type of Information is available in Mahabhulekh 7/12? Details of land as per the category – Cultivate or Non-Cultivated. Details of Loan Against this property. Now imagine that you are planning to buy a land in a specific area. There are cases of fraud when people end up selling the land which doesn’t belong to them or they end up selling the land which is hypothecated to the bank. If this happens to you then you can lose all your hard earned money. Now how can you deal with this and how can you perform the due diligence? Well, the answer to this question is that you can deal with this problem by checking the details of the land in Mahabhulekh 7/12. This will provide you with the details of the owner of the land along with the details of the loan that exist on the property. You can even get property sheet which will give you the access to a lot of information about the property. How to find information about land using Mahabhulekh 7/12? The main reason why you must be going through this article is that you might want to know about the details of the land that you are interested in. Do not worry as we are not going to disappoint you. 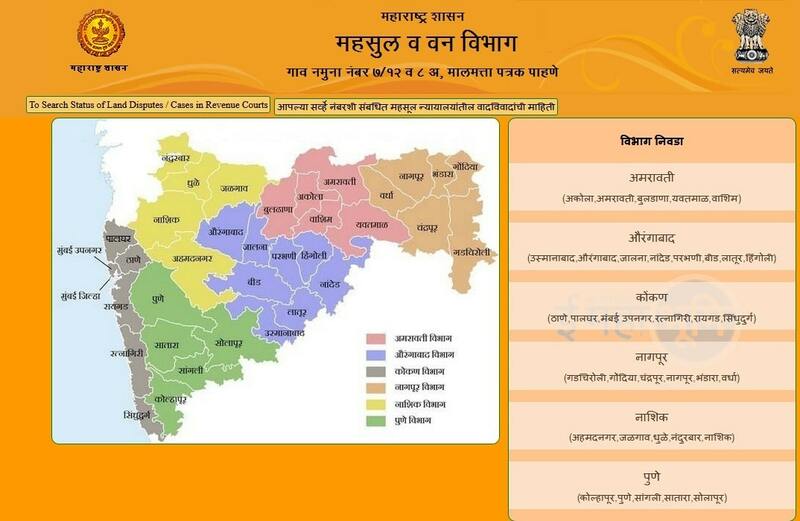 It should be noted that the details of Mahabhulekh 7/12 have been made available online now so you do not have to visit the district office to get the details. The process is quite simple and since it is available online, it is even more accessible to the people. More of people are checking the details through the online procedure and that is helping that from avoiding any type of financial fraud. We have listed the details of finding the details in Mahabhulekh 7/12 in the section below. You can follow the steps and you will be able to populate the details. The website is available in Marathi so you can change the language of the website using your browser. On the right side of the page, you will notice a section with a drop-down In this section, the major districts will be listed. From this drop-down menu, select the district that you are trying to find the details for. Click on Go button after making the selection and you will be taken to a new page. On this page, you will be asked to make a selection of the sub-district, Tehsil and Village. Select one of the radio buttons which you wish to use to make a search and once that is done, you will be able to enter the search criteria. Enter the search criteria and click on the search You will now see a list of available options. From the section below, select the one item that you want the details for. After the selection is made, you will be taken to a new page where you will be asked to validate a captcha code. Enter the captcha code and the details of the land will now be displayed on your screen. It should be noted that the details made available would be in a print-friendly format and hence you can also go ahead and obtain the print of the details which you can use for records and documentation. Remember to conduct due diligence before making any purchase as this would help you in ensuring that you are getting the right deal. This will also help you in ensuring that there is no loan pending on the property and that the details of the owner match with the details of the person that you are dealing with to make the purchase. Important Note – As per the notification from the government, you can’t use this information for a legal purpose or government purpose. For any other query about the information or the procedures, you can get in touch with Director Land Record Office. Below are the Contact Details.